What Are All Those Letters on the Back of a St. Benedict Medal? St. Benedict is widely venerated as the Father of Western Monasticism. 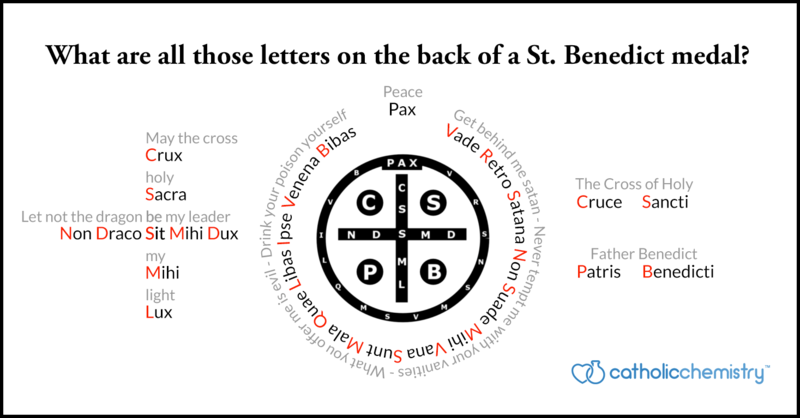 His way of life, known as the Rule of Saint Benedict, has had a profound influence on the daily focus and routine of countless religious and laity. One popular devotion to this holy man is the Medal of St. Benedict, often worn on a necklace or attached to one’s rosary beads. It is a sacramental and a great observance for any Catholic single to consider. On the back of the medal is an acronym soup of Latin phrases that, to unbelievers perhaps, appear as mere incantations. But in truth, they represent beautiful affirmations of fidelity to Christ and his cross. What do all the letters on the back of a St. Benedict Medal stand for? What do they mean? We made this nice diagram that spells it out for you. It’s the main image of this post! Head over to Facebook and Twitter to let us know what you think.